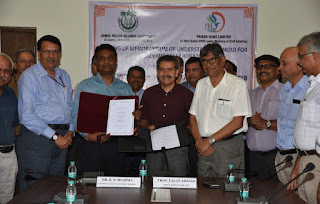 academic collaboration was signed today by AP Siddiqui, Registrar, JMI and T Sridhar, Executive Director (HR & Admn), PHL, in the presence of JMI Vice Chancellor, Prof. Talat Ahmad and PHL CMD, Dr B. P. Sharma, Pro-Vice Chancellor JMI, Prof Shahid Ashraf, Deans, faculty members and senior officials from the two sides. B. Sc. (Aeronautics) will be a dual degree course in which the graduation degree will be awarded by JMI and certificate in Aircraft Maintenance Engineering will be issued by Directorate General of Civil Aviation (DGCA), said a statement from JMI. The theoretical aspects of the course will be taught at the Faculty of Engineering, JMI while the practical training part will be provided at PHL facilities. Prof Ahmad said that this is another feather in the cap of JMI which already has MoUs with the Indian Air Force and the Navy allowing their personnel to pursue degree courses in JMI. This, he said, will enable them with fresh job opportunities after their retirement from the services. Observing that JMI has always contributed towards the nation-building, he said, that a course like this will go a long way in serving and strengthening the nation. Prof Ahmad said that the country has made advancements in aerospace and satellite research but there is scope for more research in the field of aeronautics especially given the country's topography. Sharma said that this was a historic day when two prestigious institutions have joined hands for a cause which is the need of the aviation industry. Sharma said that currently India has a fleet of 380 aircraft and 280 helicopters and with many players coming into the aviation sector, more than 500 aircraft will be added in the next 4-5 years. This, he said, will require a large number of trained engineers and personnel to maintain the aircraft.